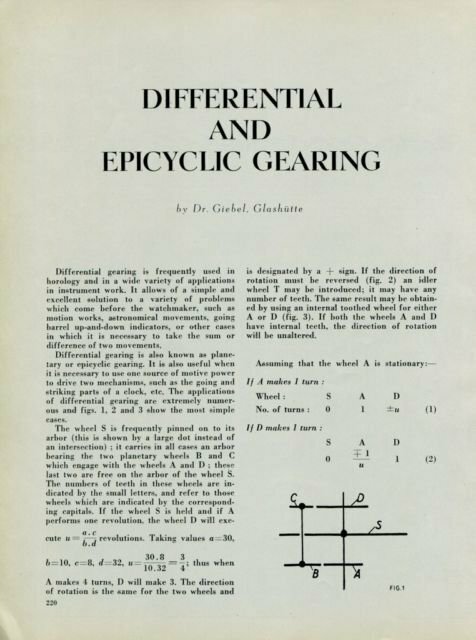 "Differential and Epicyclic Gearing" by Dr. Giebel, Glashutte - Original magazine article (magazine clipping) which was removed from a 1949 Swiss magazine. Text in the article is in English. The article includes technical information which may be of interest to the watch repairer / horologist. "Differential gearing is frequently used in horology and in a wide variety of applications in instrument work. It allows of a simple and excellent solution to a variety of problems which come before the watchmaker, such as motion works, astronomical movements, going barrel up-and-down indicators, or other cases in which it is necessary to take the sum or difference of two movements." The magazine article was carefully removed from a Swiss magazine. The article is 6 pages in length (on 4 sheets of paper) and includes a number of diagrams within the text. Also included is a second article titled "At the Workshop: Keyless Work and its defects" by H. Jendritzki. This article was also removed directly from a 1949 Swiss magazine. "Communication between the user of a watch and its movement takes place via the keyless work, and most users do not appreciate that this comprises a very small set of dual-purpose gearing, and, for good measure, a clutch. Although simple, this mechanism can give rise sooner or later to a number of troubles, and how soon these appear depends largely on the temperament of the user. In the following paragraphs the normal and rocking-bar types of keyless work will be dealt with, followed by the < negative set > type of mechanism"
This "Keyless Work" article is 5 pages in length (on 3 sheets of paper) and includes a number of small diagrams within the text. The first page of this article is located on the reverse side of the page of the "Differential and Epicyclic Gearing" article; therfore the two articles may not be separated. Combined together, the two articles are approximately 11 pages in length (on 6 sheets of paper). As with most vintage magazine clippings, there is some yellowing to the paper due to age as well as light wear and small bends. The magazine articles were carefully removed directly from a Swiss magazine. They are not a copy or reproduction. The rest of the magazine is not included.